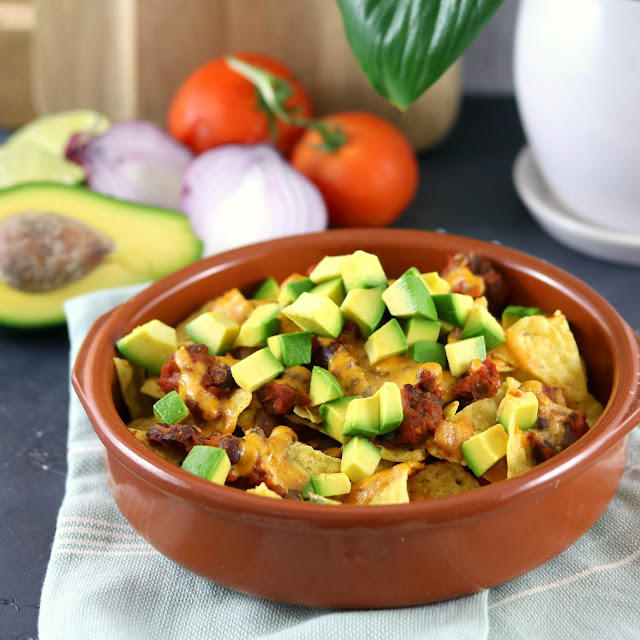 This Easy Vegan Nachos Recipe is seriously delicious and so simple to make. Corn chips are loaded up and oven baked with a topping of tomato and beans and topped with avocado and a generous drizzle of homemade cashew cheese sauce, this is a recipe even the meat eaters will love! Plant based, gluten free, healthy, dairy free and SO delicious. Want something different? Swap the corn chips for polenta or brown rice and load up the toppings! 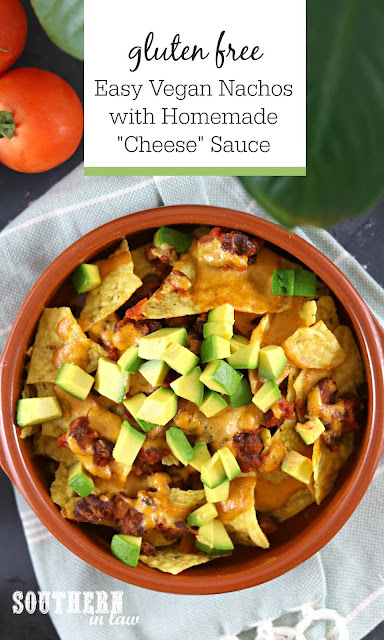 Jesse and I aren't vegan - nor do we really follow any diet "labels" (except me eating gluten free because I have coeliac disease) - but we do really love some vegan foods.... and this vegan nachos recipe is one of our all time favourites. In fact, we eat it every single week. We used to always have "Taco Tuesdays" in our house - but Taco Tuesdays quickly became anything remotely Mexican inspired Tuesdays - and when I tried the recipe for these Vegan Nachos, Taco Tuesdays were long forgotten and Nacho Tuesdays were our new thing. Best of all? These nachos are so easy to make. Even when making the cheese sauce from scratch, it will take you less than 30 minutes from start to finish - and you'll have a belly full of delicious nacho goodness before you know it. Whether you're vegan or not, I think you need to try this recipe. 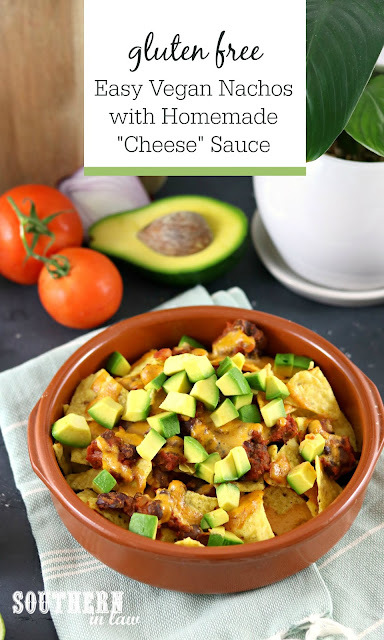 (And let's be real... if the whole vegan cheese sauce throws you off - which it shouldn't because all of our friends and family who have tried it so far LOVE it - you can always use regular old shredded cheese and call them vegetarian nachos instead). We keep this recipe really simple, but below I've also added some suggestions to make it spicy - or to add more traditional Mexican flavours. It's the kind of recipe you can play around with and make your own. 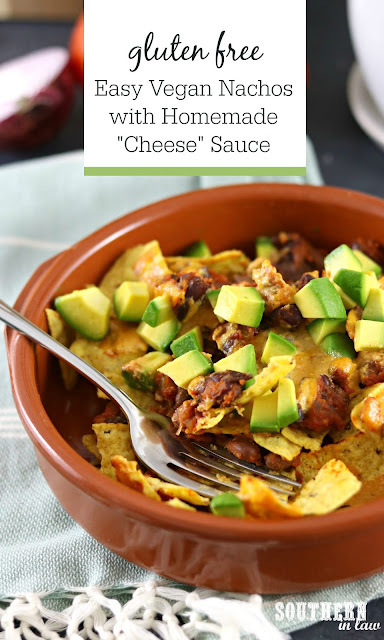 This Easy Vegan Nacho Recipe is seriously delicious and so simple to make. Corn chips are loaded up and oven baked with a topping of tomato and beans and topped with avocado and a generous drizzle of homemade cashew cheese sauce, this is a recipe even the meat eaters will love! Plant based, gluten free, healthy, dairy free and SO delicious. Want something different? Swap the corn chips for polenta or brown rice and load up the toppings! Add your onion, garlic and oil to a medium saucepan over a medium heat and saute until soft and fragrant, stirring frequently. Add in your cumin and stir, sauteing for another minute or so. Add in your beans, tomatoes and oregano and season to taste. Place a lid over your saucepan and leave your beans to cook on medium-high for 5-10 minutes, or until thickened. Remove the lid and continue cooking over a medium-high heat until your bean mixture is nice and thick and no liquid remains on the bottom of the pan. (When you push your spoon or spatula through, it should hold it's shape - this is so you don't get soggy nachos!). Add all of your ingredients to a blender and blend until smooth, scraping down the sides as needed. Line a baking sheet with baking paper and set aside (you can also make these nachos straight onto an ovenproof plate/serving dish if you prefer, skipping the baking paper). Add a layer of your corn chips, top with your bean topping and drizzle over your cheese sauce. Bake for 5-10 minutes or until your chips are toasted. Top with diced avocado or guacamole and enjoy immediately! *I never measure my spices so play around with the measurements and season to taste! **You can make these beans your own and add whatever you like. Add cayenne pepper/chilli for heat or add capsicum/bell peppers when sauteeing your onions for more Mexican flavour! Do you have any dishes you eat every single week without fail? Ours is always some kind of Mexican meal - but stir fries often make it into the mix too!